Yes, I *can* make pastry. Really. But it’s so fiddly and time consuming. The clean-up afterwards involves scraping vast amounts of flour off kitchen surfaces. Ain’t no one got time for that! I love to simplify cooking, so I buy frozen pie crusts and cut my work in half. Literally, this recipe takes a few minutes to make. I mentioned in my last post that we have pet chickens. I like to call them “pets with benefits.” It’s amazing having your own fresh and delicious source of eggs, but there are times when it’s hard to use as many eggs as the girls produce (they average one egg per day during their peak laying years.) With six ladies, well, that’s a lot of eggs. The solution is clearly, quiche. I had a ton of veggies in my fridge needing to be used up, and of course, plenty of eggs! 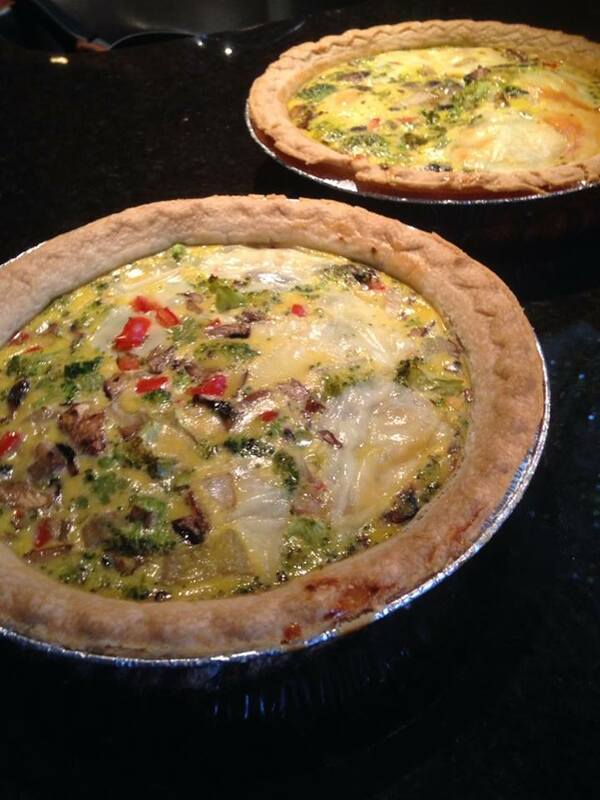 So, I did the sensible thing and made beautiful vegetarian quiches. 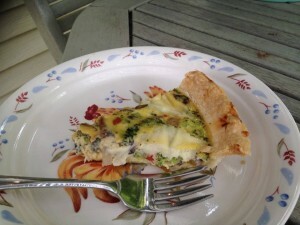 Quiche is such a versatile food great for breakfast, brunch, lunch, snack…anything goes, really! The best part about getting your pie crusts pre-made is that they come in two’s – one for a quiche today, and one for your freezer – or, better yet make a fruit pie with the other crust – voila, dessert! In a large frying pan, heat oil, and sauté all vegetables over medium-high heat until softened slightly (5 minutes or so.) Beat eggs and cream well, and add in cooked vegetables and cheese. Season with salt & pepper. Divide the quiche mixture between the two crusts. Preheat oven to 350. Bake quiches for about 40 minutes (watch them closely, you’l be able to tell they are ready when the egg has cooked through, and the crust is golden brown at the edges. The egg mixture will also be pulling away from the sides of the crust. Looks delish, Catherine! Can’t wait to try this recipe. Nice Vegetarian Quiche From this nice cat.